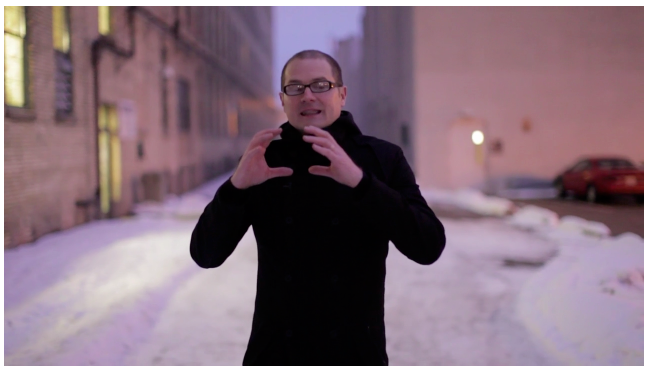 Bellapalooza: a bit more on the Rob Bell Love Wins controversy. Bring on the (civil) critiques and four cavaets. Oh my, my friends. I outlined yesterday some virtues and practices for civil discourse—how to “speak the truth in love”—and I’m really, really appreciative of the kind remarks folks have made. One friend wondered, though, if my call to civility would have the unintended consequence of obscuring serious critique, in this case, of Rob Bell’s heterodox views of hell and God’s judgment. If you saw the comment thread, you’ll see that I admitted the concern is a fair one, but not particularly relevant here. 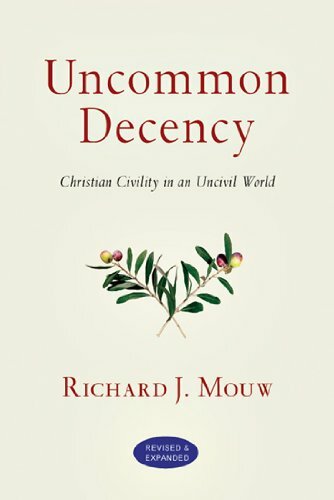 Richard Mouw’s book, Uncommon Decency (InterVarsity Press; $16.00) that I so commended, says (as I pointed out) that we need both conviction and civility. We must always debate fairly and honestly and kindly, I said, but, as Mouw puts it, there are “limits to civility.” He has a chapter called “When There is No Other Hand” about those times when on-going dialogue and pleasantness is inadequate to the demands of honest protest. Is this now a time to stop being polite and bluntly protest the dangerous ideas of Mr. Bell’s book? I don’t think so. I do not intend to obscure differences about his ideas or suggest we dare not make judgments as we engage in endless nice conversation, but I do not think it is wrong to exercise some patience as we debate this complicated theological matter and hear each other out. Bell is not the first to write about this and he will not be the last. Welcome to Living Theology 101. So, theology is sometimes a bit messy and we don’t all agree. It is obviously vital for us all to explore what we believe and why and how it does or doesn’t fit in to the ongoing story of redemptive history; we should have some room to explore ideas, I’d say; our respect for others (even if we think they are off-base) and the practice of gracious hospitality demand a bit of that. I hope you have a community that encourages honest conversations around serious study of the Biblical texts and that you can take up this conversation face-to-face. We need not fear questions. Of course this needs to be civil, but it also needs to be real. One influential blogger today suggested there is a difference between fair questions and a spirit of constant questioning. Well, fair enough, but what do we do with one who has endless questions, who can’t quite take the standard position? Tell her, eventually, to shut up or go to hell? I don’t think so. As you can see, I’m still thinking about the ways in which Bell’s book has been evaluated these past weeks; interested, as I said in the last post, in the conversation about the book as much as the book. â€¨â€¨Below is a link to a 3 minute example that I found a touch unsettling. It is well worth watching. The interviewer on MSNBC asks some tough questions of Bell, and I think they are fair. But near the end, he says something very critical about the quality of the book and Rob’s bad intent and says something like “isn’t that true?” Bell says no it isn’t and the guy doesn’t bat an eye, and continues on as the interview turns towards hostile interrogation. It raised good questions but I felt it was a tad smarmy and needlessly confrontational. And then a couple of friends with whom I was emailing criticized Bell for being vague, while I was reeling for the odd tone of the questioner. Interesting, eh, these differing perceptions. â€¨â€¨A common trope against Bell is that he’s watering down the gospel in order to make it culturally palatable and a few say that in terse comments after the video clip. Now that is a good case study: I do not think that is a fair accusation and violates the principle that it is uncivil to impugn the motives of someone without warrant. His teaching may be having the effect of watering down Bible truths (although he doesn’t see it that way) but he nowhere says “let’s do away with some stuff because it isn’t cool enough for our postmodern culture.” So the comments carrying this unfounded accusation at the post are also troubling. The video is a helpful window into the controversy. Another very interesting, thorough, and important critical review comes from Kevin DeYoung over at the Gospel Coalition site. I really liked his excellent book Why We Love the Church: In Praise of Institutions and Organized Religion and a book he recently did on the beloved Heidelberg Catechism, The Good News We Almost Forgot. I respect him as a passionate, youthful, conservative, Reformed pastor and writer. I need to reply to a bit of his strong critique, will use it as a bit of a case study, and will mention it again in my own review of Love Wins tomorrow. For now, I suggest you print it out if you have to, get a cup of coffee, and settle in for a lengthy assessment. You may want to bring your Bible. He doesn’t use his sense of humor much, but he gets credit for, in another place, calling this whole business a Bellapolooza. sort of discourse, a style of engagement that isn’t helped by our fast-paced lifestyles, 24/7 talk news channels which model vitriolic debate, or the Web 2.0 “cult of the amateur.” I mentioned the importance of the recent Nicholas Carr book, The Shallows, regarding this internet milieu. In this hot-wired age it is hard to do slow reading, to offer careful consideration and to submit to a humble “hermeneutic of love.” I hope my suggestions for fair play didn’t just add to the noise or further the courseness of our public discussions. Hey, at least I wrote a lot, and didn’t just do a tweet. Ha. Getting cured of incivility means learning how to speak more honestly. But I have insisted that civility runs deeper than words. It is grounded in the way we view reality. This means that we Christians must work to view things—as far as possible for mere mortals—the way God does. This is an understandable reaction, and in a sense it is perfectly legitimate. God’s majesty is so awesome that everything else pales in comparison. How can we offer anything short of total commitment to such a being? Can we do anything less than hate those who hate the Lord and loathe those who rise up against him? But abruptly the psalmist seems to catch himself. He senses that it is rather presumptuous for a creature such as he to pretend to have either the knowledge or the integrity to posses a “perfect hatred” of unrighteousness. So he pleads, not for the defeat of the hosts of wicked ones, but for a correcting grace that will reach into the depths of his own being. This is where a proper view of reality begins: in our own awareness of the divine gaze. The Lord not only hears all–he sees all. He knows not only our habits of speech; he sees the hearts in which those habits are formed. Christian discipleship is permeated by the consciousness that we live coram Deo—before the face of God. 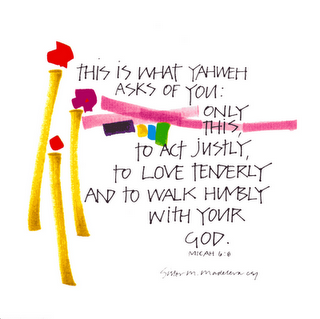 disciplines that remind us that we are coram Deo? Perhaps contemplative time with God being shaped into the character of Christ whose image we are to bear, might calm us a bit. It might give us greater passion for justice and truth, too, but it may make us “poor in spirit.” You know, it seems that some of the zealous Puritans who like that phrase coram Deo sometimes don’t write in a way that illustrates that they’ve been with the God whose holiness they so love to remind us of. And it seems that some of the hipster Bell supporters seem to be so enamored with the marketing package–the Love Wins plasticine cover design is pretty cool—that they hardly sound like they care about holiness at all. Or humility, or any of what Greg Spencer has called in a recent book, “the quieter virtues.” Maybe if we regularly whisper the Jesus Prayer—Lord have mercy on me, a sinner—it might shape how we do our critiques. And I say this to myself, as well. â€¨â€¨ I have to admit I am nervous about talking about Love Wins. I don’t want to get it wrong (in style or substance) and I know I’m going to lose respect and business because of it, one way or the other. There are several important reasons (and some unimportant ones) why evangelical folks get riled up by discussions of heaven and hell; all the best theologians and all the major creedal documents are pretty explicit about hell (the Apostle and Nicene Creeds less so, interestingly.) Before describing this passionate, interesting, and in many ways perplexing book which takes issues with the standard views, I just have to offer a few more random notes. Sorry. Firstly, I thought I was clear, but since a few have asked, I will assert (as I did above) that it is absolutely appropriate to speaking firmly with conviction when one believes with good reasons that an idea or book is unfaithful to Biblical truth, that it cannot be seen as consistent with the Biblical story. Even though we must avoid (as I outlined last night) unwarranted insinuations and cheap shots, to painstakingly critique the truthfulness of an author’s teaching is certainly appropriate and sometimes called for. Not every bad book is worthy—bad enough or interesting enough—to be taken seriously enough to deserve a hard-hitting critique. I think Bell is important enough to be taken seriously and those that have dismissed him cavalierly are unwise. It’s just a book. As a bookseller I do what I do because I believe in the power of the printed page, the influence of books (for better or worse) and the importance of the ideas they carry. This is my bread and butter, so do not misunderstand. Not a day goes by that I do not talk about the significance of good books and the danger of bad ones. r good and bad that the edicts of kings and legislatures. It was this: they shaped and swayed men’s minds. And because he who enlists a man’s mind wields a power even greater than the sword or scepter, these men shaped and swayed the world. Few of them ever lifted a finger in action; they worked, in the main, as scholars—quietly, inconspicuously, and without much regard for what the world had to say about them. The extraordinary power of their ideas. I still use the old adage a mentor taught me years ago “ideas have legs.” Or, as Calvin Seerveld noted, perhaps some “grow legs.” So I do not underestimate the power of words, the deadly influence of ideas in books. Still: Love Wins is just a book with an overblown subtitle. Few people will build their whole worldview around this short and punchy essay by Rob Bell. Many will have their minds made up before they approach it and I doubt it will rock the world much. Even his own congregation in Grand Rapids is debating his views, so the conversation, the context of the social interactions, the discourse about the book is a major aspect of the phenomenon and may be as important as the text itself. It is not the apocalypse, it just isn’t, so lighten up just a bit. So here’s a question: Does the inclusive vision of Bell’s invitation to live in presence of a fully loving God, His understanding of the mercy at the heart of the reign of God over a being-restored creation, lead to greater service to the poor, to more fruitful mission, to deepening examples of solidarity with the hurting? Does it bear that kind of fruit? Jesus asks us to ask that question. And are his critics known for these very things, or not? I’ve said and linked to what I think is one of the best critiques of Love Wins I’ve seen by Kevin DeYoung, a good pastor from a good church also in Michigan. Perhaps I am mistaken, but he seems to minimize Bell’s concern for the sins of war, assaults against women, oil spills and other violent injustices (he says these “vices” are “well known” which isn’t the sort of thing said by those whose hearts are broken by these sorts of things.) Has his church been involved in working against torture or stopping the grinding third world debt crisis or justice for women or with the homeless? I don’t know, of course, but Bell’s church is known for these things. It would be an over-statement to say “ignore anybody who critiques Rob Bell’s theology if they aren’t at least as faithful at living out Matthew 25 as he and Mars Hill are” but not by too much. I didn’t make up that line about fruit. Who cares? Rob Bell—and others who are working on alternative understandings of hell and judgement, rethinking the best way to understand the Biblical texts about wrath, reframing notions of propitiation and penal sacrifice and such—insist that these traditional views are a stumbling block, that the toxic nature of that particular way of telling the story of redemption and the seemingly violent God behind it have turned off a “staggering number” (as Bell puts it) of sensitive and subsequently unchurched people. In his critique, DeYoung counters that a “staggering number” want the straight-up, unvarnished truth, the way he preaches it, presumably. I’m just not so sure. 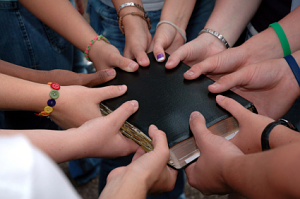 Liberals like Spong & Borg, post-evangelicals McLaren & Bell, and emergent guys like Pagitt & Jones, all suggest in their own way that a major reason young adults drift from the church is because of their distaste for evangelicalism’s antiquated doctrines and judgmentalism. Even the must-read Unchristian: What a New Generation Really Thinks About Christianity….and Why It Matters (David Kinneman & Gabe Lyons) moves along these lines, using some research. Frankly, this just isn’t my experience. Is it really yours? I think that most unchurched folks just don’t care much about the God of the Bible, don’t find going to worship all that interesting or meaningful and generally don’t know much about church life or orthodox theology, one way or the other. They aren’t really rejecting classic doctrine as it isn’t even on their radar screen. Bell makes a case that his telling of the gospel is, besides being most deeply Biblical, is, after all, a “better story.” Critics retort that (a) it isn’t a better story if it ain’t true and (b) traditional teachings about God’s glory, sovereign grace, wrath averted and limited atonement are a much better story anyway. This is a very important debate–we have to get the contours and details of the Bible Story right—but my sense is that neither are all that compelling to the world, mostly because few people care—they are living by the scripts given them by the North American culture and worldview, reinforced by “secular liturgies” as James Smith’s extraordinary Desiring the Kingdom puts it. us with his unchurched friends; they think he is so scary and weird–and he is.) Bell, importantly, brings some of those who have been hurt into the narrative of the book—more on that tomorrow. But I suspect that he overstates how many spiritually-abused, set-free-from-toxic-faith victims of hurtful religion he really encounters. Some people just go to Mars Hill because they like the light show or his cool glasses or the hip music or the non-liturgy. (I am not all that cynical, really, just saying what I suppose most mega-church leaders are very aware of themselves.) Of course we have to seriously care for those who are victims of legalism and fundamentalist narrowness and it is to Bell’s credit that he is able to help create a safe place for spiritual refugees and exiles. That is a great grace and to be affirmed. Still, I don’t think that most folks run from the gospel because they fear fundamentalists. Most folks just don’t care, or even know about, much of this. Framing the debate around this “we have to tell a better story to attract victims of those scared by teachings about hell and damnation” or “we have to teach conservative Reformed theology because people want the unvarnished truth” allows both camps to think that their views are more culturally weighty than they probably are. â€¨â€¨So here I am, writing about this at a local coffee-shop. I’m sitting here pondering all this and just now in walks a somewhat frazzled, apparently single father, buying something creamy and fruity for his two little daughters. A lovely and graceful woman came up to them, bringing cookies she just bought to the kids, and told the man her story of raising children after a divorce (or a spouses death or something, I couldn’t quite make it out.) She handed him a card. Now I don’t know if he most liked her high heels and perky haircut or the free cookies or the kind words of great encouragement she spoke: you don’t have to do this alone. She reminded him of the card telling of a support group (a Christian ministry?) that he could attend to draw strength and guidance and find friends. I heard her say, again, that there is hope. I do not think that the working class dad, the two kiddos, or the support group evangelist gave one whit about Kevin DeYoung’s or my thoughts about Rob Bell or what Rob Bell thinks about hell. Let’s just keep this in perspective. The book may be interesting to read and important to debate, but we are fooling ourselves if we think many people care. We are not saved by our ability to describe salvation properly. And the corollary, one’s salvation is not usually in danger due to theological error. In yesterday’s post I noted that I have a heart for–as Jesus surely does in a depth I cannot comprehend—ecumenical efforts towards Christian unity. I mentioned good books on this like John Armstrong’s Your Church Is Too Small and Robert Benson’s The Body Broken. It is just unacceptable to say that mainline Protestants or Eastern Orthodox or Roman Catholics or the currently persecuted Egyptian Copts (not to mention radical Anabaptists, historic black church folk, Latino Pentecostals or Joel Olsteen’s cheery TV congregants) are somehow not a valid part of the Body of Christ, are not true Christians. Bell perhaps embarrasses himself when he says that Origen, whose views on hell were roundly denounced, or the Platonist Clement of Alexandria, say, represent the “deep, wide, and diverse stream” of “historic, orthodox, Christian faith.” But his impulse to take a wide, long view is correct. Some of the harshest critics of Love Wins seem to suggest that if you can’t articulate the five points of Calvinism or don’t use their particular rubric for selecting the most pertinent texts and their proper interpretations or if you unwittingly endorse a lame false doctrine, or are part of a denomination whose national headquarters published something questionable, you may not be a real Christian. This over-emphasis on knowing and saying the right stuff about doctrinal formulations marginalizes folk from other denominations and traditions who explain their faith differently or don’t sound in their style of talking about their convictions the way they should. Some may even sing the hymns that DeYoung describes as so meaningful to his flock and—imagine!— they may not resonate with the lines he cites (about wrath averted, say.) Or they may sing completely different hymns with a somewhat different orientation. I know some Christians who find Good Friday services much more deeply moving than upbeat Easter ones. Should I wrinkle up my nose and say they must not understand the victory of God? Ethnicity, culture and denominational tradition play a large influence here, too, and we’d be wise to attend to how that happens (and why it isn’t being mentioned in the Bell brouhaha.) Dare we think ill of others if their experience of God and testimony of their understanding of grace is a bit unlike what the critics, the guardians of orthodoxy, describe, or if their liturgical habits or ethnicity have shaped them to talk about faith in somewhat different terms? I think it is wrong to just naturally jump to the uncharitable conclusion that this means others have “another gospel” that must be rebuked; this default position to be against others who name the name of Christ if their understanding or expression is different than ours is wrong-headed. Again, Jesus most often affirmed the theologically inarticulate and blasted the doctrinal know-it-alls. Authentic faith is pre-theoretical trust not theological precision, so as interested as we should be in God-glorifying, Christ-exalting, Kingdom-bringing, historically-shaped, Biblically-proper doctrine, the variety of ways of doing that and getting it said is to be provisionally affirmed, not fought. Those who understand this, I think, will approach Bell’s book with a bit more willingness to listen appreciatively rather than to only scrutinize it for error. I think the severe critiques of Bell offered all over the internet not only privilege certain denominations in ways that erode an honorable concern about ecumenicity but they obviously privilege the theologically well-read and maybe the left-brained to boot. Again, do not misunderstand me here: I believe in theological education and theological debate (and love selling books to well-educated book lovers!) But let’s be honest—many admirably serious and deeply pious and significantly faithful followers of Jesus simply have never been exposed to the systematic theology (or exegetical tools) demanded by critics like DeYoung. Heck, though-out most of church history, and, globally, today, most Christians can’t even read! This does not leave authors (in this case, Rob Bell) off the hook, of course and it would be goofy if you think I’m saying that. It does remind us, though, that this exceptionally detailed line by line analysis as done by DeYoung, an analysis I have read carefully with great appreciation and have commended to you, is not the sort of thing most people do. Friends, the apostle Paul uses his most forceful rebuking language (in Galatians 1:6-9 and famously in Galatians 5:12) for those who teach any other gospel, who insist there is something else to do other than receive God’s grace shown in Christ. And this claim that imprecise theological speculation can lead you to hell is, I believe, approaching a very close form of “another gospel.” We are not saved by (theological) works, or any kind of works (lest anyone should boast of getting it right, I think I hear Ephesians 2:8 saying.) I don’t know if Bell is right that love always wins, but I know this much: God is not going to smite you if you read Love Wins, not even if you mostly like it. 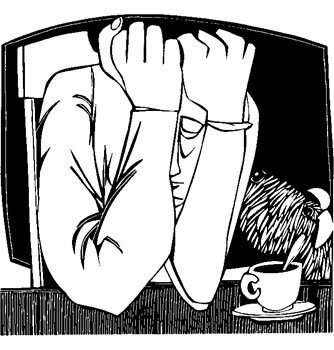 Your eternal suffering is not so much at stake here, regardless of the huffing and puffing of the good pastor. Doctrinal certainty (which I’m mostly for) does not prove you are saved any more than doctrinal doubts consign you to hell. I presume that DeYoung agrees. That overwrought Big Ending is just foolishness, the redutionism of theologyism run amok. â€¨â€¨Read the sentences before the last one, though; DeYoung offers good advice. Having seen the above interview with Bell, and several others over the past few years, I cannot help but wonder how much of his “fame” has been brought on by his mega-congregation’s money. Bell seems genuinely unable to give a straight answer to any questions that are posed to him, especially about the matters on which he writes. He somehow landed a publishing contract wherein, it seems, he is paid to give voice to every outlandish thought that crosses his mind, then never offer anything in the way of depth or conclusions about those thoughts. I have not yet read this book, but I have read several of his other works. From that I can only conclude that Mr. Bell is much ado about nothing, and would best be ignored in the manner of Charlie Sheen and the Real Housewives. He has about as much of substance to offer Christians as they do. The comparison between Rob Bell with Charlie Sheen and the Real Housewives is quite unfortunate. Bell does draw from serious biblical scholarship, such as his comments on Luke 15, the “finding the lost stories.” Meanwhile, Mr. Sheen and the Real Housewives are just the kind of people our Lord would seek out and break bread with. 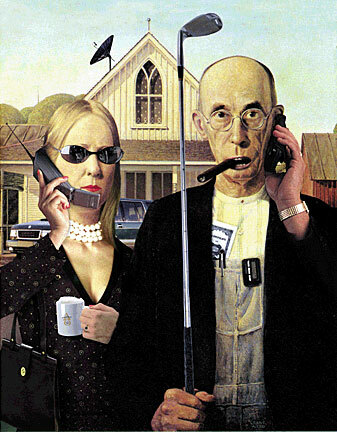 At our store here in W. Michigan we have Bell and DeYoung partisans who snipe at each other, but I constantly try to point them to the wider stories of God’s work across cultures and across histories that make these controversies seem small and insignificant. I’m afraid I disagree with you about your analysis of DeYoung’s big ending. His ending is exactly what makes his long valuable review of Love Wins worthwhile, since it brought into scope the reason to decry such bad theology. And indeed bad theology hurts real people. That is a fearfully true truism if their ever was any. And saying so does not invalidate the truth that we are saved by grace alone. But it is grace through faith in Jesus Christ. Which makes it essential that we present Jesus, not Bell’s, DeYoung’s, mine or your idea of Jesus. But Jesus as revealed to us in scripture. And that we be extremely careful not to take any license with doing so. If it was not essential to defend and keep this creedal truths as it was entrusted to the church, I wonder why Paul will go through such lengths to correct false theology in the church. Knowing that this corrective is being written to those who already profess faith in Christ and whose faithfulness he sometimes commends. Herein lies the problem with Bell, he is a pastor and a teacher and an “authority” on the gospel. So for someone with that level of influence to present a warped gospel is dangerous. I agree that discernment is important but one must be careful not be so “discerning” as to be apologetic for falsehood. Thank you friend. This is clear and solid, I think. However, the point I want to underscore is the saying properly precise theological things (as important and helpful as it is) is not what gets us saved. Trust, yielding–Lord have mercy on me a sinner–is enough. How the cross works, the mechanisms of atonement, theoretical notions of which exegetical option for hell is best is all extra. Vital, but not necessary. Anyway, thanks for your contribution. We agree that thinking well about good doctrine is important, and a proper view of Biblical truth is urgent. Does Bell help us at all get there? In some ways, I think so. That’s what my next two big essays are about. All of your thoughts on Love Wins have been very, very helpful to me. Thank you. I loved the book because it made me think about Jesus…a LOT. I believe that’s what Rob bell intended.